Thanks Karl! I’m still a big fan of your app, lots of ways to get value out of it. One question I have. Did you look at the chats themselves? When in the habit of split testing, it’s easy to view live chat as just another page element, but of course live chat isn’t a page element. Customers perceive it primarily as the human interaction because that’s its essential purpose. So you would also be including the live chat team and its processes as well in the split test, if that makes sense. For instance, the sales team may have moved the chatters out into a slower but more lucrative sales process. Yup, we spent a lot of time seeing which types of chats came in. That’s why we wanted to expand it across the rest of the site. Our SDR team thought it was great. They’d get a couple of high quality prospects every month and they were able to disqualify weak prospects faster. They loved it. 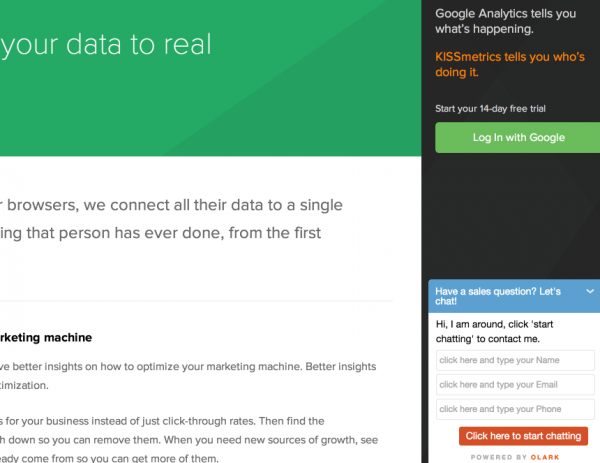 Our A/B test looked at data all the way down the customer funnel. So it included our SDR followup process in addition to the page element on the site. But the impact on customers was small enough that we weren’t able to detect a lift or drop at any degree of certainty. Delaying the live chat pop-up might help. It’s rare for a variable that small to move the funnel in a major way but it does happen occasionally. As for the VWO case study, I’m HIGHLY skeptical of any proclaimed lift unless people are willing to share the data and the statistical significance reached on their test. 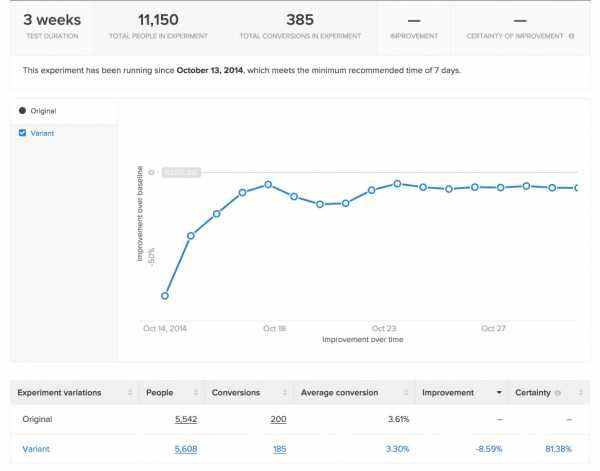 For example, a 31% improvement at 90% statistical significance really doesn’t mean much. It’s way too easy to hit false positives. Also, 30%+ wins are exceedingly rare. In my experience, I’ve only seen a few tests improve signups by that degree. Usually, you’d need to test different value props, offers, or complete funnel rebuilds to get that kind of win. I highly doubt Ez Texting got a 31% win off a Live Chat widget. I could be completely wrong in this prediction, I just want to see the data first. This is the first article I read on your blog Lars and I must say it was totally amazing! Props also to the Olark team for their replies and chiming in. It’s a great demonstration of how things might get screwed due to politics or blindly following popular tactics and competitors. Very down to earth and realistic approach. Looking forward to your next articles. I wanted to chime in here because at LeadChat, we see this all the time. When you install live chat on a poorly optimized website (see http://www.allsuburbs.com.au/) that has a long enquiry form that’s hard to find, it works wonders. But the reason is, the site is terrible. So, live chat can easily give a 4-8x conversion uplift. However, on sites that have a extremely well optimized conversion flow and strong CTAs, if you don’t know what you’re doing, you’ll kill conversions with live chat. We did a trial for a company called Sanebox last year who has an extremely well thought out (and tested) homepage. 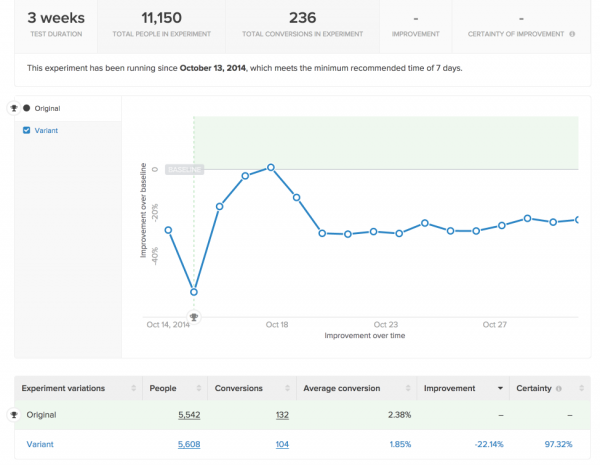 Our chat implementation (and team) couldn’t lift conversions noticeably. Since then, we’ve evolved significantly along with the data we capture. 1. Sunir is right, the proactive popup shouldn’t be instant. But it shouldn’t be 25 seconds either. At LeadChat, we apply the following measure. If standard conversion rate is >5% on a particular page, don’t install live chat (at least initially). If it’s between 2-5%, do a thorough analysis on the average time to complete the form (CTA), and hit people in the sweet spot between average form completion time and time to leave that page. In some cases, it can be over 30-40 seconds. Even better, don’t show chat button at all (ie, hidden from view) and only popup after that time (so they can’t click a compressed chat button either). Sure, you’ll leave some leads on the table, but you’ll pick up the cream without affecting the base. 2. You used Pre-chat survey. Ie, you asked people for name, email and phone number to engage in chat. Technically, this is more information required from the visitor than clicking the main CTA. So it was doomed by virtue of the setup. Best practice is not to have this, and have agents trained in capturing lead information. 3. Another way to implement to catch the stragglers is to use click-to-chat. So, next to your main CTA is some small text underlined that says, “questions? click to chat with an expert” and this link pops up a hidden chat box. Not only do you measure the clicks, but you get more qualified chats. Not all chat platforms do this, but the better ones do. 4. Never have after hours on chat. It’s a CTA killer, and it’s plain rude. It’s like walking into a retail store, and being met with a 16 year old pimply-face stored attendant who’s playing on his iphone, looks at you and yawns, and goes back to playing with his phone. Using smart triggers, personalizing the experience depending on a bunch of factors – referral source, country, previous visits to site, etc. This has a big impact to conversions as well. As you know, at LeadChat we do hundreds of thousands of chats for companies as small as dentists and as large as major healthcare providers, SaaS, banks, etc and what I’m sharing above comes from very conclusive analysis. Wow, this is incredibly helpful Gary. And I bet you’re right. 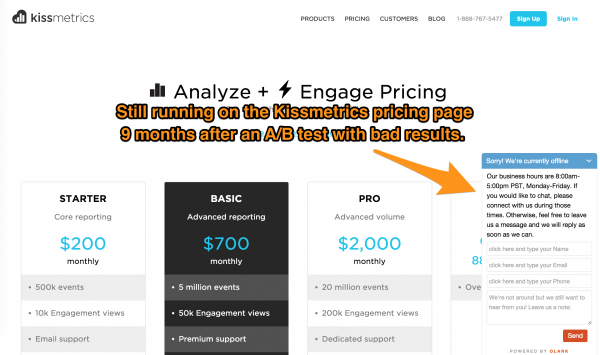 We had spent a ton of time optimizing some of the pages on the Kissmetrics website. So you’re probably spot-on with needing to be more careful with live chats on optimized sites. Wow another killer comment, thanks Gary! Lars, great findings. What do you feel about Drift’s revolt against forms though? I recognize the fact that Drift encompasses a larger feature base than Olark but it started out as chat. Drift is doing what it needs to do in order to get attention. I’d be doing the same thing. Lead forms aren’t dead, just like Slack never killed email. 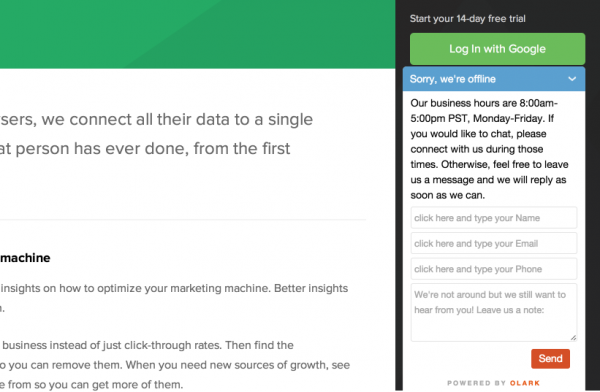 Companies can use email and a chat tool side-by-side. You can also have lead forms and a chat tool on your site side-by-side. If I was managing the marketing site for a B2B SaaS company right now, I’d try out Drift to see how my prospects reacted to it. But I also wouldn’t have plans to remove my lead forms entirely. There’s a time and place for everything. I would love to talk to you about this but there’s no live chat on this site! I really wonder why my sales are actually gone down since I implemented tawk. Probably it is a good idea to take off and see if there are a dance in the sales graph.